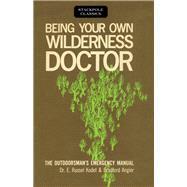 Being your own wilderness doctor for the security of knowing what to do for the best—in case of the worst—a more than first-aid companion that’s always there when a doctor may be too far away. Angier who knows the outdoors, and Dr. Kodet who knows people—inside and out—team up to present life-saving, panic-preventing information for times when making the right decision is most vital. Here are trip-saving ways to handle the sometimes painful but rarely serious accident-health problems that can face campers, hikers, and vacationers…cuts, sprains, insect bites, blisters burns. Here’s what to do when a misstep results in fracture, break, dislocation, swelling. Know how a doctor would view symptoms that loom larger as the metropolis recedes; how he’s handle the problem; how to differentiate between minor protests of hard used muscles and signs of serious trouble that call for prompt professional help.